The NBA is entering—if it is not already at the peak of—an era that is player driven to an unprecedented degree. On the court, with each team running just five men at a time, it’s much easier to focus on stars and individual players of interest. Off the court, players are afforded more leeway to curate their public and online personas than in any other major sport, and they take advantage of it. As fans, we have access to the interior lives of stars and secondary players alike like no other consumer base in sports. Thus, it is appropriate that the end of the regular season and start of the playoffs should signal a celebration of memorable players as much as it does memorable teams. The following awards (that I wish actually existed) encapsulate the players who, for better or for worse, configured the way that I’ll remember this regular season. Of all the guys who made “the leap” this year, Siakam’s rise was almost certainly the most meteoric. As a third-year pro and late first-round pick that provided little in his first two years outside of energy and defense, he entered the season competing with OG Anunoby for a complimentary spot in the starting five. What he’s done since has been revelatory. As a sort of Kawhi Leonard-Draymond Green hybrid, Siakam has transformed into a three-point shooting, versatile offensive weapon and a switchable lock-down defender. He’s shown promise as an isolation, crunch-time scorer, as evidenced by his game winner against Phoenix and his 44-point effort in a win over Washington with Leonard injured. But his real impact comes when he doesn’t have the ball in his hands. Alongside Leonard and Danny Green, Siakam highlights the most fearsome group of switchable wings in the NBA, with the ability to guard three positions at an elite level and five positions competently. On the offensive end, he cuts, screens, knocks down open looks, and is rapidly improving as a passer. His value was on full display in the biggest moments of Toronto’s overtime win over Miami last Sunday night. With the game tied late in regulation, Siakam switched onto the handler four times in one possession before forcing Dwyane Wade into a long contested two, pushing the game into overtime. Then, holding a slim lead in overtime, he hit a dagger corner triple to ice the game. Role players aren’t supposed to be such transformative forces and yet, time and time again, Siakam has taken over games when asked. His performance in the playoffs, where he is virtually untested in his young career, could be the difference between a second-round exit for Toronto and an NBA Finals berth. Honorable mentions: De’Aaron Fox, Montrezl Harrell, Justise Winslow, and Bojan Bogdanović. Vučević has had a productive, but relatively nondescript career for Orlando thus far. He’s a longtime double-double machine, but has never been a 20 point-per-game scorer or led the Magic to the postseason (he has a grand total of three career playoff minutes, all from his rookie season with Philadelphia)—that is, until now. In year eight, without much of a supporting cast to speak of, nobody expected Vučević or Orlando to make the leap this season. And yet earlier this week, Orlando clinched its first postseason bid since the Dwight Howard era, led by their new (first-time!) all-star center. Just as remarkable as Vučević’s late-career maturation is the path he took to achieve it. In a new meta that has led to NBA big men zigging about the three-point arc, Vučević zagged, decreasing his jump-shooting output and increasing his time spent on the glass and around the rim. With opposing bigs shrinking in recent years as small ball gains popularity, Vučević has very much stayed the same size, a healthy seven feet and 260 pounds. Instead of pivoting from his strengths, he’s leaned into them to great success, and is playing a bygone style of big man offense that leans more on the power end of the skill-power spectrum. His regular season was impressive, but replicating his success against first round opponents, former DPOY Marc Gasol and the Raptors, is a tall order. Honorable Mentions: D’Angelo Russell, Tobias Harris, Paul George, and Nikola Jokić. This season was perhaps the richest in NBA history for lovers of social media quarrels, passive aggression, and general basketball melodrama. That Jimmy Butler—who months ago was creating galaxy-brain-level strategies to sow discord in Minnesota—might not even be top three on the ballot speaks to how deeply absurd and petty this season has been. But no one embodies absurd and petty quite like Irving. Irving has had a whirlwind past couple years. Once universally beloved, he first began to draw ire by publicly peddling in empirically false conspiracy theories, such as the notorious flat-earth theory and the moon landing conspiracy. He then solidified his villain status by forcing his way out of Cleveland to join the high-powered Celtics, which was, at least, a marketable image. But his behavior this season has just been strange. In October, he announced his intention to stay in Boston after his contract expires this fall. Since then he’s equivocated on that promise, and subsequently lashed out at the media for caring about where he would play next year. He’s also drawn attention for criticizing his younger teammates multiple times, and then he lashed out at the media for caring about the locker room chemistry of one of the Association’s premiere franchises. Finally, he found the spotlight yet again at All-Star Weekend, where he was spotted having an animated conversation with fellow superstar Kevin Durant, with whom he’s long been reportedly interested in joining forces. Then—stop me if you’ve heard this one before—he lashed out at the media for wondering whether two of the league’s marquee players would be teaming up next season. Irving is brilliant on the court, infuriating off of it, and for sports talk radio hosts, he’s the gift that keeps on giving. Honorable mentions: Butler, Durant, Lebron James, and Joel Embiid. As frustrating as Melo’s time in New York could often be, his post-Knicks career has taken on a new level of depressing. It was less than two years ago that Anthony openly scoffed at the idea of taking on a reserve role for the Thunder, leading to the now-infamous line “Ay P, they say I gotta come off the bench”. Anthony never did come off the bench during his 78-game stint in Oklahoma City, but after finding a home with Houston this offseason, he was quickly forced to adjust to a lesser role. And, well, he didn’t adjust. Besides his obviously diminished athleticism and lack of interest in defensive effort, Melo posted abysmal shooting numbers during his brief stop with the Rockets, tallying career lows across the board with .41/.33/.68 splits. After an ignominious exit from Houston just 10 games into the season, Anthony has yet to find a new home. As shocking as it may have sounded just a few years ago, it seems likely that Melo’s Hall of Fame-worthy career is over, despite his relatively youthful age of 34 (same as Lebron!). It’s a sad, precipitous decline for an all-time great, to be sure. But at least his free agency status allowed him to spend Wednesday night at the final NBA game of his friend and draft classmate, Dwyane Wade. A bittersweet, but mostly happy sendoff for what might be the last time that we see either of these legends on an NBA floor. Honorable mentions: Isaiah Thomas, Draymond Green, Avery Bradley, and Enes Kanter. Harden and Giannis Antetokounmpo are both extremely deserving candidates, and it will be hard to complain if either takes home the NBA’s most coveted individual accolade this year. But where Giannis has been phenomenal, Harden has been historic. After a terrifyingly mediocre start to the year for the injured Rockets, Harden single-handedly lifted the team back to home-court advantage status in the uber-competitive Western Conference. With star teammate Chris Paul injured, Harden rattled off an eye-popping 32 game streak with 30 points or more. For context, the previous record (post NBA/ABA merger) was just 17. Harden now apparently needs a seperate Wikipedia page solely dedicated towards tracking his records. He’s making history in front of our eyes. 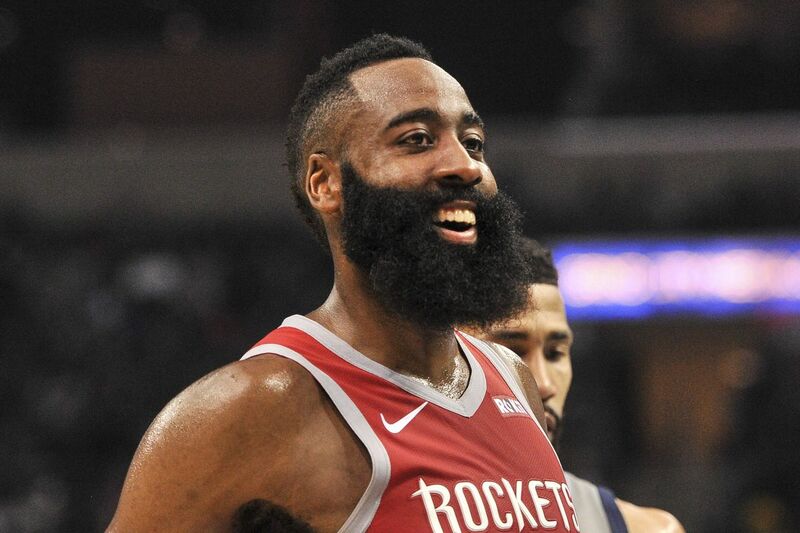 In January, with both Paul and third option Clint Capela injured, Harden had perhaps the most torrid scoring week in NBA history, averaging 52 points per game over a five-game span. That number isn’t the crazy part, though—the kicker is that over those five games, he recorded ZERO assisted buckets. This, to my eye, marks the clearest delineating factor between Harden and Giannis. For all his greatness, the Bucks would probably still be a playoff team without Giannis, and he alone could probably not lift a weak roster to championship contender status. With his only high-tier teammates injured, Harden (almost literally) single-handedly kept Houston’s season alive. It’s absolutely true that in the playoffs, when energy is higher and play is more physical, Giannis’ clear defensive superiority may make him more of an asset than Harden. But MVP is a regular season award, and during the 2018-19 season, Giannis’ greatness fell just short of Harden’s transcendence. Honorable mentions: Antetokounmpo, Stephen Curry, Paul George, and Embiid.